These businesses sell videos, books, paintings and photos of Alaska. Alaska's CD Based Audio Tour of Alaska's Road system. Listen as you drive! Natural & Cultural History, as well as interesting information. 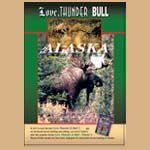 A professional photographer offering stock photos, greeting cards & prints of Alaska scenes & wildlife. The only national bear hunting magazine! We cover all species and methods of bear hunting. Outfitter listings and reviews and Alaskan hunting stories! Art gallery of Jon Van Zyle, Iditarod artist. Features the best selection of posters and prints and innovative gifts by Jon and Jona Van Zyle. Larry Kaniut's books include;"Alaska Bear Tales", "Cheating Death" and "Some Bears Kill". All books sold from here are autographed by Larry. We create beautiful 3D raised-relief wall maps. Our map of Glacier Bay National Park shows amazing 3D detail of the dramatic mountains, glaciers, fjords, bays, and forests.